Rajan Jha, first Vice President of ASCE Virginia, has been recognized as one of the ten “2016 New Faces of Civil Engineering Professionals” by the American Society of Civil Engineers (ASCE). Rajan did his Bachelors in Civil Engineering from Punjab Engineering College in India and Master’s in Water Resources from Virginia Tech. At Virginia Tech, he worked with his professor (Dr Panos Diplas) on developing a new river classification system and design guidelines on stream restoration structures. 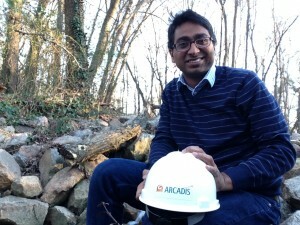 Currently, he is working with Arcadis in Richmond Virginia. The New Faces of Civil Engineering-Professional Edition recognition program promotes the bold and humanitarian future of civil engineering by highlighting the achievements of young civil engineers, their contributions to and impact on society. Rajan and other 9 New Faces will be officially recognized during ASCE’s annual Outstanding Projects and Leaders (OPAL) Gala on March 17, 2016, in Arlington, Va.